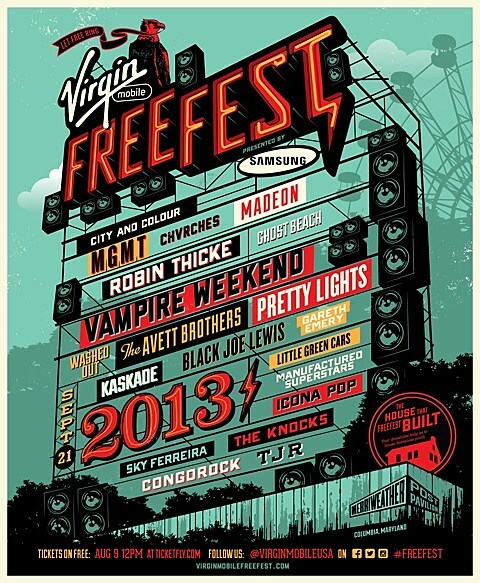 The VIrgin Mobile FreeFest is returning for its fifth year on September 21 at Merriweather Post Pavilion in Columbia, MD. This year’s lineup leans pretty heavily on indie/pop crossover with names like MGMT, Vampire Weekend, Washed Out, The Avett Brothers, CHVRCHES, Icona Pop, Sky Ferreira, Robin Thicke, Pretty Lights, Kaskade, and more. Free tickets go on “sale” August 9 at noon, and a presale (via Twitter and Facebook) begins August 8 at noon. There will also be premium packages which guarantee admission, and include a t-shirt and souvenir cup for free fountain drinks at the festival. Any contributions will go to Washington, DC’s transitional home for homeless youth, The Sasha Bruce Re*Generation House, which the festival had been raising money for over the last four years to help have it built. Speaking of Washed Out, he just announced some other special free events happening in NYC and LA this week.